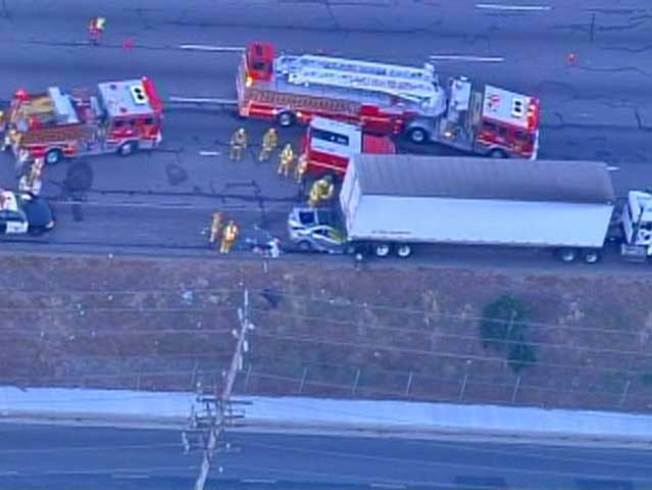 Two people are dead and a third is critically hurt after slamming into the rear of a big-rig on the northbound 101 Freeway. The California Highway Patrol said the pre-dawn crash shut down all northbound freeway lanes early Friday. Southbound lanes were also shut down until 5:30 a.m. while a helicopter landed on the highway to airlifted the injured person to a hospital. A car was wedged underneath the rear of the big-rig trailer. The 4:40 a.m. crash occurred just past the Kanan Road exit near Reyes Adobe Road, backing up morning commuter traffic and holiday getaway travelers getting an early start for the Fourth of July weekend. As of 6:40 a.m., at least two lanes were closed on the northbound side of the freeway. Authorities said the lanes would remain closed for an unknown duration. The backup extended to Las Virgenes Road.